Originally published on Friday, 15 November 2013 12:56 at Upside Down World, and written by Mariel Perez and Dana Brown. César García, a husband, father, and outspoken leader was assassinated on November 2 by a gunshot wound to the head as he was heading home with his wife and nine-year-old daughter after a day of work in his small-farmer community. Garcia led farm workers in brave and staunch opposition to a large-scale mining project in the Tolima department of central Colombia. Little more than one month prior, a similarly tragic story unfolded. On September 30, 36-year-old Adelinda Gómez left a meeting of her community’s women group, part of her countless efforts as a leader and human rights defender in the small agricultural municipality of Almaguer, in the Cauca department of southwestern Colombia. As she was walking home, she was attacked by two unidentified individuals, who shot her to death and left her 16-year-old son in critical condition. Just one month before her death, Adelinda had received an anonymous telephone call in which she was ordered to stop speaking out against mining or she would get herself killed. Adelinda and César’s tragic assassinations are sobering examples of the increasingly violent context surrounding large-scale mining and other extractive industry projects in Colombia. When President Juan Manuel Santos took office in 2010 and declared mining one of the principal locomotoras or engines of the Colombian economy, communities and individuals like Adelinda and César strengthened their mobilization efforts to peacefully protest mining projects because of the serious environmental and human rights issues associated with the largely unregulated industry. Colombian human rights organization CINEP notes an exponential rise since 2008 in the number of social movements protesting extractive industries such as carbon, gold, and petroleum, seemingly in response to the increased economic focus on mining. In a manifestation of civil society’s mobilization in response to the serious problems caused by mining, communities and rights groups, organized under the Network of Solidarity and Fraternity with Colombia (Red de Hermandad y Solidaridad con Colombia), recently conducted a Juicio Ético or People’s Tribunal against transnational mining corporation AngloGold Ashanti, citing evidence of grave violations of human rights and International Humanitarian Law, including forced displacement, aggressions against community leaders, and lack of consultation of affected communities. This people’s tribunal concluded that transnational corporations as well as the Colombian government must be held politically and legally accountable to citizens, given the devastating human rights effects of the largely unregulated mining sector in Colombia. This rising trend in social unrest exposes how mining activities constitute an imminent threat to the livelihoods of local communities; human rights defenders and communities have had to organize in response to recent legal efforts to ease restrictions on mining and to combat the consequences of Free Trade Agreements (10 of which have been signed or negotiated since Santos began his presidential term), which ultimately prioritize transnational companies by imposing restrictions that make it more difficult for the Colombian government to protect its people. The issues at stake are so pressing that the Colombian government’s own oversight institution, the Comptroller’s Office, dedicated a 200+ page report to the consequences of large-scale mining. In the document, the Comptroller warns of the serious human rights effects of unbridled and unregulated large-scale mining, using data to show how mining projects reward companies with accumulated wealth while leaving Colombia with only accumulated waste. The institution warns that current laws impose no limits on awarding mining titles for projects, they do not limit environmental licenses that permit mining activity, and they do not employ adequate enforcement mechanisms in terms of environmental impact studies related to mining projects. Even more grave is the lack of appropriate consultation of Indigenous and Afro-Colombian communities in regards to proposed projects, despite the fact that Free, Prior, and Informed Consent of these communities is enshrined in the 1991 Constitution. Although Colombians are exercising their constitutional rights in mobilizing against these devastating large-scale mining projects, the deaths of brave defenders like Adelinda and César show the high risks involved in confronting the powerful economic and political interests at stake in large-scale extractive projects, as well as the State’s failure to protect and defend the rights of its citizens. The Comptroller’s report underscores the strong links between extractive projects and violations of human rights, underlining concern around the increased militarization and the exacerbation of conflicts that mining causes. The statistics presented in the report seem to justify these worries. For example, 87% of forced displacement originates in areas with mining and energy projects. Other numbers further cement this correlation: 78% of crimes against trade unionists occur in these regions; 89% of violations against indigenous peoples; and 90% of those against Afro-Colombians. In total, 80% of human rights violations in Colombia occur in zones contemplating or already hosting large-scale mining and energy projects. Civil society presented one example of this correlation during its juicio ético against AngloGold Ashanti; human rights defender Alejandro Uribe Chacón was killed by members of the military, who were assigned to the Sur de Bolivar region to protect strategic zones for mining. While this execution took place in 2006, the human rights problems persist in this economically strategic region. Just a few weeks ago, human rights groups warned of a plan to assassinate leaders in Sur de Bolivar who are mobilizing against mining projects in the area. The huge risks to the lives and livelihoods of those opposing mega-projects reaches beyond the mining sector. In the municipality of Ituango in the department of Antioquia, the Movimiento Rios Vivos, a rights group peacefully protesting the construction of a hydroelectric dam, denounces frequent threats and attacks against its leaders. Just last month, Rios Vivos leader Genaro Graciano was nearly killed after a small explosion was intentionally caused just in front of his home. ASOQUIMBO, an organization protesting the construction of the El Quimbo dam in the southwestern Huila department of Colombia warns of a similar situation of violence, denouncing massive forced displacement of communities by the armed forces and violence against those peacefully protesting the dam project. Colombian human rights organization CODHES also reports a relationship between occurences of forced displacement and regions or municipalities that are in the government’s Territorial Consolidation Plan, a plan that foments foreign investment in the extractive industries in rural regions. This correlation underscores the state’s support of transnational corporations over its own people. Further evidence of the state’s prioritization of transnational interests is the fact that the 2001 Mining Code, which is still in force, classifies mining projects as public utility works. This implies that national development projects will always take precedence over local interests. Given the current reality, this means that the government’s locomotora, or economic engine, legally trumps the human rights of its citizens. The Comptroller’s office warns that human rights violations related to mining will become a bigger problem as the government grants more and more land titles to victims claiming their land rights through the 2011 Victims and Land Restitution Law. This is because almost all towns that are at the center of the government’s land restitution law are currently developing mining projects. In a sense, the increased link between the presence of extractive industries, megaprojects and violations of human rights seems to be reminiscent of the “conflict minerals” situation in certain African countries. Though in the Colombian case, it is important to note that mineral wealth not only lines the guerrillas’ pockets, but also those of state and para-state actors. While the FARC’s role in illegally mining tungsten ore is most visible at the international level, corporations, state agents, and paramilitary groups have also benefitted from a loosely regulated extractives industry. US coal mining company Drummond, for example, is known to have extensive links with paramilitary groups whom they paid to threaten and assassinate those contesting the company’s economic interests in Colombia. Furthermore, virtually the entire emerald trade in Colombia (which accounts for a whopping 80-90% of the world market) has long been controlled by paramilitary actors. The military’s 2006 assassination of human rights defender Uribe Chacón for the benefit of AngloGold Ashanti exemplifies the state’s direct role in fomenting conflict mining. A more recent example involves Colombia’s use of legal recourses to protect large-scale mining interests over the rights of Colombian citizens. In the municipality of Piedras in the department of Tolima, citizens held a popular referendum in which 2,791 individuals voted to reject mining projects in the region and only 24 voted in support of large-scale mining. While these mechanisms of participatory democracy are binding according to current law, the government directly undermined these rights in May of this year, enacting a decree that rules that citizens cannot halt the awarding of titles for mining projects, regardless of the degree of popular opposition. In effect, the state is legalizing conflict mining through its economic policies and through the use of legal recourse that benefits large-scale corporations, to the serious detriment of Colombian citizens. 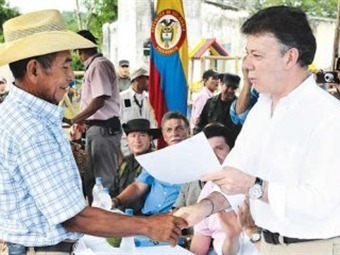 While Santos agreed to put the land issue on the table of negotiation with the FARC, recognizing its role in the exacerbation of the Colombian conflict, victims of the armed conflict are not party to the negotiations and there are no discussions of mineral rights for communities, leaving dangerous room for loopholes that may allow corporations to continue to take lands from their rightful owners. Given Colombia’s increased economic aperture and the growing prominence of extractive industries and megaprojects, the government cannot expect to fully address the land issue without talking about natural resources. 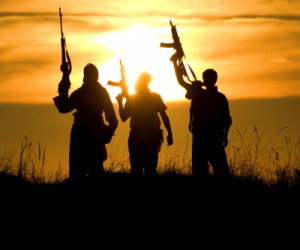 A true political will for peace must go beyond demobilizing the guerrilla and address all of the factors and actors that exacerbate violence in the country. This week we celebrated news of a new agreement at the negotiating table between the FARC and the Colombian government regarding political participation. This is an important step towards reaching a full agreement on the end of the armed conflict and a huge achievement for the negotiators. Nevertheless, Colombians know that much more than a signed agreement with the FARC is needed in order to bring lasting peace to Colombia. In addition to the need to dismantle neoparamilitary organizations and negotiate with the other remaining guerrilla groups, a lasting peace in Colombia would require economic and social justice that includes equitable access to land and natural resources. While the prospects for peace in Colombia seem grim given the increasingly violent conflict surrounding extractive industries and their so-called development projects, the tireless efforts of members of civil society cannot be overlooked. Recently, Afro-Colombian communities succeeded in legal action against the State, which had identified portions of their collectively-held land as strategic mining zones under a 2012 Resolution. The Court declared that the labeling of these areas as strategic mining zones violated Afro-Colombian groups’ rights to Free, Prior, and Informed Consent, a success in upholding communities’ rights over the rights of transnational corporations. Nonetheless, the Court failed to make a statement on other fundamental rights, including the communities’ rights to land and cultural diversity, and a healthy environment. As the shortcomings of the decision show, much work remains in ensuring the rights of Colombian citizens. Adelinda and César’s recent deaths are a testament to this fact. They are the devastating manifestations of the dehumanizing effects of uncontrolled large-scale extractivism and neoliberal development in Colombia and of the high costs of putting national and transnational economic interests before the lives and livelihood of the Colombian people.